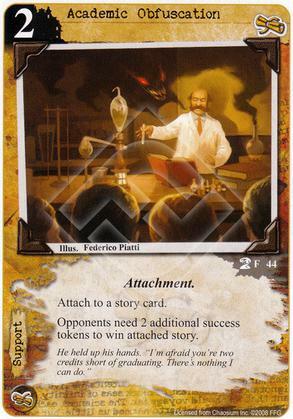 Flavor Text: "He held up his hands. 'I'm afraid you're two credits short of graduating. There's nothing I can do.'" I have a Shub/MU deck, and the deck loves itself some Pervasive Toxemia. The faction split is roughly 75% Shub, 25% MU. I'd like to include either Academic Obfuscation or The Grim Monolith to hopefully keep Pervasive Toxemia on the board for an extra turn. I'm a little uncertain which one to pick. Should I go with Obfuscation in order to help my MU resourcing curve? Or, should I go with The Grim Monolith, which at a cost of 1 will be much more certain to see play? I'm leaning toward the Monolith because this also happens to be a Mi-Go deck, so I really just need time, in general, to build up my forces. Thanks in advance for the help!